A "LOVE" sculpture stands in London at the corner of 99 Bishopsgate – the site of the 1993 bombing by the Irish Republican Army. Indiana died Saturday at his home in Vinalhaven, Maine. His death came a day after a controversy emerged over control of his work, with a federal lawsuit alleging that Indiana had been isolated from his loved ones, and that his art had been exploited for profit. The case involves an art publisher and a caretaker who had been granted power of attorney, as The New York Times reports. Born Robert Clark, the artist changed his name to Indiana as a reference to his home state. In 1946, he had turned down a chance to go to art school in order to enlist in the Air Force. After he left the service, Indiana attended the School of the Art Institute of Chicago under the G.I. Bill. Indiana moved to New York City in the 1950s, meeting artists such as Ellsworth Kelly and Cy Twombly and working a string of jobs as he honed his art. In the 1960s, he began making one-word paintings and met Andy Warhol and other influential artists. The work LOVE began as a Christmas card that was commissioned by The Museum of Modern Art in 1965. At the time, Indiana was nearly 40 years old and had enjoyed success as an artist in New York – but nothing like what was awaiting him. The painting quickly became a symbol of the flower-powered '60s; in the years since, it has persisted as both a pop symbol and an elegant reminder of a core human emotion. Indiana created a 6-by-6 feet painting of the work in 1966; he would go on to turn it into sculptures; and in the 1970s, LOVE became a U.S. postage stamp. For Indiana, who once called himself simply an American sign painter, the now-iconic design followed early iterations that highlighted the word "love," including a 1961 work titled Four Star Love. He also presented it as a play on the phrase "God is love," creating a circle in 1964 that framed the message Love Is God. For Indiana, it was his own translation of a phrase he often heard during his youth, when he was being raised as a Christian Scientist. In different presentations, Indiana also used a range of contrasting colors to highlight LOVE. But the colors of the first version hint at the deep meaning the work had in the artist's own life. "The red and the green came from the Philips 66 gas sign," Indianapolis Museum of Art curator Martin Krause told NPR in 2014. "His father worked for Philips 66, and he remembered that combination; it fixed itself in his mind. And when he began making the LOVE paintings in 1965, his father died. So the red and green of the [MoMA] LOVE painting, silhouetted against the blue Indiana sky, is in memoriam of his father." As Indiana told NPR in the same 2014 report, "Everything is relating to my own life." That message now stands in cities around the world, from New York City and Philadelphia — home of the famous LOVE Park — to Tokyo and Singapore. In some cases, LOVE remains in its original form. It's also been translated into Spanish, Hebrew and other languages. Other works by Indiana serve as reminders of his mother – particularly the one-word piece HUG, from the early 1960s. Other paintings juxtapose the words "EAT" and "DIE." "'Hug' is my mother's word for affection," Indiana told NPR. "'Eat' was the last word that she said before she died. After his breakthrough success, Indiana was commissioned to design a hardwood basketball court for the NBA's Milwaukee Bucks, featuring bright yellow paint and the arena's nickname (the MECCA), along with two gigantic M's. 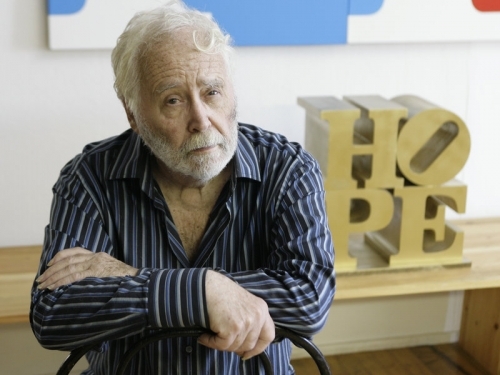 But decades after creating LOVE and other popular works, including the similarly designed HOPE, Indiana complained that the art world had shunned him. "LOVE bit me," Indiana said in 2014. "It was a marvelous idea, but it was also a terrible mistake. It became too popular; it became too popular. And there are people who don't like popularity. It's much better to be exclusive and remote. That's why I'm on an island off the coast of Maine, you see."